A School Resource Officer has a diverse role in the school community and has many duties and responsibilities. Police In Our School teaches kids about the important role their school resource officers play to protect them and their school. 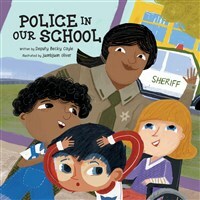 Becky Coyle learned first hand how children can misunderstand thier resource officers role in her work as a deputy sheriff and was inspired to create this School Safety series to explain school safety to young children in a fun and engaging way. Extension activities and questions for further discussion are provided in the final spread. Becky Coyle combines her passion for writing and her work as a deputy sheriff and school resource officer to create informative and engaging books that help children understand the importance of safety in their school. Becky lives in Tennessee with her husband, John, and their two dogs, Rookie and Cadet. She is the proud mother and grandmother of four wonderful children and five exceptional grandchildren. juanbjuan oliver was born in Mallorca, Spain and grew up drawing monsters, animals, and superheroes. As an adult, Juan decided to spend his life focusing on what he’d always loved doing: drawing. He now spends his days as an illustrator for children. His favorite part about his job is creating things from his imagination that young Juan would have enjoyed.